– Hip replacement surgery, also called total hip arthroplasty, involves removing a diseased hip joint and replacing it with an artificial joint, called a prosthesis. 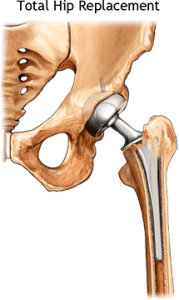 – Hip prostheses consist of a ball component, made of metal or ceramic, and a socket, which has an insert or liner made of plastic, ceramic or metal. The implants used in hip replacement are biocompatible — meaning they’re designed to be accepted by your body — and they’re made to resist corrosion, degradation and wear. – Between 200,000 and 300,000 hip replacement operations are performed in the United States each year, most of them in patients over the age of 60. According to the American Academy of Orthopedic Surgeons (AAOS), only 5–10% of total hip replacements as of 2002 were in patients younger than 50. – A standard hip replacement operation takes 1-1/2–3 hours. Most patients can start driving six to eight weeks after the operation and return to work full time after eight to 10 weeks, depending on the amount and type of physical exertion their jobs requires. – DO NOT move your operated hip toward your chest (flexion) any more than in an right angle. This is 90 degrees. DO NOT sit on chairs without arms. DO NOT sit low on toilet or chair. DO NOT turn your knee cap inward when sitting, standing, or lying down. – It sounds too good to be true? It probably is. Of course, it is possible to have hip replacement surgery, take a significant dose of pain medication and go home the next day. The reality is that hip replacement is a major operation involving trauma to tissue and removal and replacement of bone. In the interests of your best recovery, there has to be a period of recuperation and rehabilitation. – Hip avascular necrosis (commonly called “AVN”), now better known as osteonecrosis (“osteo” means bone; “necrosis” means death), results from interruption of the normal blood flow to the femoral head, or the “ball” that fits into the hip’s socket. If left untreated, this loss of blood flow to the hip ultimately causes the “ball” to die and collapse, leading to extreme pain, loss of hip motion, and eventually, severe arthritis. – There are two major forms of AVN, traumatic or non-traumatic (meaning no injury). Hip fractures or hip joint dislocations, partial or complete, are the most common causes of AVN. – The most common risk factor is the use of oral or IV steroid medications (corticosteroids such as Prednisone). Another very common risk factor is excessive use of alcohol: the greater the consumption of alcohol, the higher the risk of developing AVN. – In fact, about 25% of patients with AVN of the hip develop the disorder for no apparent reason. About two-thirds of the people who develop avascular necrosis of the hip are in their 20s and 30s. Avascular necrosis is diagnosed in about 20,000 people each year. – Once the hip joint is severely damaged (severe collapse and arthritis), then hip replacement essentially becomes the only reasonable treatment option. If AVN is diagnosed in its earliest stages and the diseased area of the femoral head is very small, a procedure called core decompression and bone grafting can be done with some success. – Fortunately, there is good news for adolescents and young adults under the age of 50 diagnosed with hip avascular necrosis, including select patients with later stages of disease, larger sized lesions, and limited collapse. A highly specialized surgical procedure called free vascularized fibular grafting – a unique form of bone grafting – can restore the dying hip and prevent hip replacement with much greater success. – Pain in the hip? Don’t ignore it. – A hip fracture is a break in the upper quarter of the femur (thigh) bone. The extent of the break depends on the forces that are involved. – Hip fractures most commonly occur from a fall or from a direct blow to the side of the hip. Some medical conditions such as osteoporosis, cancer, or stress injuries can weaken the bone and make the hip more susceptible to breaking. In severe cases, it is possible for the hip to break with the patient merely standing on the leg and twisting. A large proportion of fall deaths are due to complications following a hip fracture. One out of five hip fracture patients dies within a year of their injury. -In 2007, there were 281,000 hospital admissions for hip fractures among people age 65 and older. 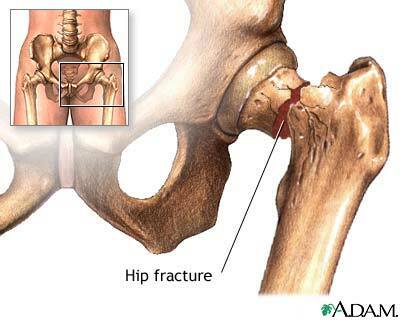 – Over 90% of hip fractures are caused by falling3, most often by falling sideways onto the hip. – In 1990, researchers estimated that by the year 2040, the number of hip fractures would exceed 500,000. However, since 2000, the annual number of hip fractures has remained relatively constant. – From 1990 to 2006, hip fracture rates declined significantly in men age 85 and older and in women age 75 and older. It is not known what factors are contributing to this trend. – In 1991, Medicare costs for hip fractures were estimated to be $2.9 billion. – Treatment typically includes surgery and hospitalization, usually for about one week, and is frequently followed by admission to a nursing home and extensive rehabilitation. Up to one in four adults who lived independently before their hip fracture remains in a nursing home for at least a year after their injury. – Most people who suffer a fracture, don’t get appropriate tests done to determine if they have osteoporosis. 95% of adults who break a bone are, typically treated without being evaluated for osteoporosis. So if you have a fracture, get a bone mineral density test done. – 23% higher consumption of carbohydrates was associated with 3 times higher rate of fractures! – Hip Bursitis or trochanteric bursitis occurs when the bursa in the hip becomes inflamed and swells. This bursa is located on the outside of the hip over the hip bone. – The main symptom of hip bursitis is pain at the point of the hip. The pain usually extends to the outside of the thigh area. In the early stages, the pain is usually described as sharp and intense. Later, it may feel achier and spread out. – Hip bursitis (trochanteric) can be caused by running. Hip pain is not at all uncommon among runners and joggers, and this can be from bursitis. – The initial treatment for hip bursitis does not involve surgery. Many people with hip bursitis can experience relief with simple lifestyle changes. – Your health care provider may recommend temporary rest or immobilization of the affected joint. – Non-Steroidal Anti-Inflammatory drugs (NSAIDs) such as ibuprofen may relieve pain and inflammation. Formal physical therapy may be helpful as well. – If the inflammation does not respond to the initial treatment, it may be necessary to draw out fluid from the bursa and inject corticosteroids. Surgery is rarely required. – If the pain is affecting your gait or you are limping, then you should not run. Avoid hills and up-tempo or faster running. Icing after activity and again at bedtime can help with the inflammation in the bursa. – Recently, MRI and ultrasound studies have brought into serious doubt the idea that bursitis is the etiology for trochanteric pain.